With armistice day being yesterday, someone asked me: 'how do I search for relatives who served at war'? - So I thought I would write an article on this to help anyone new to the world of WW1 records. Firstly, the easiest record to use for finding out information about WW1 relatives is service records. These can be found online at many of the big family companies, like Ancestry and Find My Past. However, two thirds of these records were destroyed in World War 2. They can contain a lot of information such as parents, wives and children, which is helpful when trying to locate your relative. They normally have a few pages of information such as height, eye colour and when attested as well as their service history. 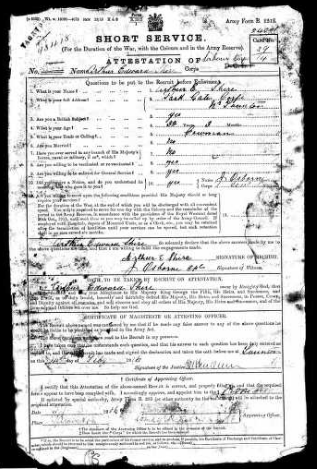 This is the first page of Arthur Edward Shire's service record. From the index card you can find your relative on the 'Medal Rolls', for World War 1. These can only be searched on Ancestry - if your not able to get to the National Archives in Kew. These do sometimes contain extra information such as battalion, dates of entry & demobilisation and how/why they were demobilised among with a variety of other information. These are usually done collectively with about 10 people per page. An example of Arthur's (in yellow) is shown below. With all the information you can get from these you can then try and get the battalions war diary to see if your relative is mentioned or you can use them to find out what they got up to. 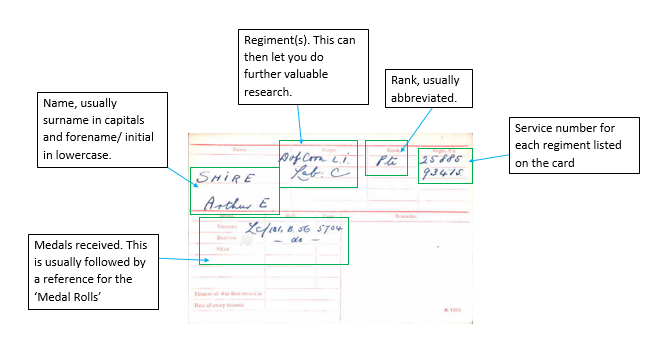 If you still can't find out your relatives war diary you could look for people in the regiment with a similar service number and find out what battalion they were in. *Note - this won't always work*. For Arthur this would put him in the 12th Battalion. Formed in Plymouth in April 1916 and moved to France as Army Troops to Fourth Army. April 1917 : became 156th and 157th Companies of the Labour Corps. This would suggest that between April 1916 to April 1917 he was in the Fourth Army before he joined the Labour Corps. This matches what was on his 'Medal Roll Index Card' so is probably his battalion. If we then search for the 'Fourth Army' we can see that he took part in the Battles of the Somme and the Pursuit of the German retreat to the Hindenburg Line. The Labour Corps was slightly different to the the pioneer battalions and they did labouring tasks instead of front line action. Arthur survived World War 1 and returned back to his family in Corfe, Somerset.